The info here is in a state of flux, everything can be changed! The main timeline for the House of Hozz. Currently in a very tentative state. Llieah stolen by The Fayrie, replaced by a changeling. Durand and Llieah are married. Durand and Llieah escape to earth. The drought in A city starts. A series of big rainstorms in A city ends the drought. I'm working on a timeline organizer/visualizer. 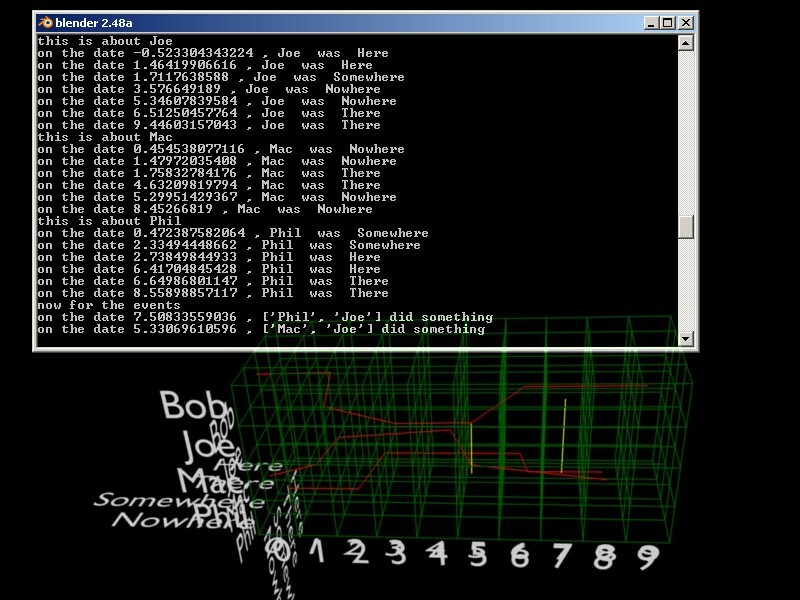 Right now it prints out paths for individuals and stats for events, based on the geometry in the scene. It's kind of hard to see, but rather nifty in the way it works. Should be useful for keeping track of all our dudes, and perhaps for visualizing the storyline. I'll work on a visualizer, which will convert text description into graphical data. Also, an editing utility in blender would be good, and not too hard to implement... probably. This page was last modified on 10 January 2009, at 18:51. This page has been accessed 2,656 times.